The central problem at the heart of Israel’s half-century old military court system is clear: these courts will never reflect the interests of the defendants, but rather that of the regime of occupation. Israeli occupation apologists masquerading as protectors of Palestinian children in military detention? Few displays of alternative facts should shock us these days, but somehow an upcoming event by the Israeli right-wing group NGO Monitor’s at the UN Palais De Nations in Geneva comes close. Under the Orwellian title “Protecting Children: The realities of Israeli Military Juvenile Justice in a Terror Environment,” the event planned for Sept 25th features such doyens of child protection as the former IDF Chief West Bank Prosecutor, Lt. Col. (Res) Maurice Hirsch. A recent recruit to the Israeli hasbara (public relations) industry, Hirsch seems committed to denying Israel’s 50 year-long occupation — instead, he euphemistically refers to “the changing borders of the State of Israel” — as well as trying to legitimize Israel’s military court system, which has faced broad criticism by British experts, UNICEF, as well as B’Tselem, for its systematic and widespread mistreatment of Palestinian minors. Hirsch oversaw the prosecution’s part in the assembly line that forces virtually all Palestinian minors prosecuted by the army to accept conviction by plea bargains — which usually lead to incarceration. 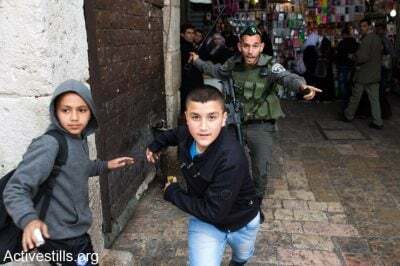 In 2015, the last year for which official data is available, 95 percent of the approximately 540 Palestinian minors indicted in the military courts were convicted. This is done through interrogations that violate minors’ rights, such that they incriminate themselves and others; these incriminations are later presented to the military court, with no other evidence. Military courts deny most minors bail and the few exceptions are routinely appealed by the military prosecution, which is also responsible for the high percent of indictments – 62 percent of the 871 minors arrested in 2015. In response to criticism, Israel has implemented tried and true tactic: cosmetic changes that enable it to continue imprisoning Palestinian children. These included several changes to the military legislation, such as formalizing the age for prosecuting Palestinians as adults, the establishment of the military court for youth, and changes in detention and remand periods. Legal cosmetics, however, will not meaningfully improve the treatment of Palestinian minors or the protection of their rights. Israel has also attempted to deflect criticism by initiating a “secret dialogue” with UNICEF, the UN program that provides humanitarian assistance to children in developing countries, in order to improve its image. But according to the latest UNICEF update, “the data demonstrates the need for further actions to improve the protection of children in military detention, as reports of alleged ill-treatment of children during arrest, transfer, interrogation and detention have not significantly decreased in 2013 and 2014.” And this comes following the “secret dialogue”. Official Israeli statistics present a large increase in the numbers of Palestinian minors serving prison sentences since the round of violence that broke out in late 2015, and a renewal of administrative detention of minors. All this indicates that the situation has not improved, and that the system still rejects the principle that the detention of minors should be a measure of last resort and for the shortest appropriate time. The central problem at the heart of Israel’s half-century old military court system is clear: these courts do not – and never will – reflect the interests of the defendants, but rather that of the regime of occupation. Under Israel’s two separate and unequal legal systems, military judges and prosecutors act as Israeli army officers enforcing martial law over a civilian Palestinian population living under military rule. The jurists did not speak to Hirsch, who took up his post in 2013, but his conduct seems to reflect a similar position: treating all Palestinian child detainees, regardless of age, as terrorists, while denying Israel’s obligations as an occupying power in the West Bank. In 2016, bloggers Noam Rotem and John Brown revealed a series of private Facebook posts published by Hirsch, in which he demanded to hang the killers who committed the horrific killing of five members of the Fogel Family in March 2011, and for the “elimination” of Hamas heads on a daily basis until Israeli soldier Gilad Shalit is freed. According to Rotem and Brown, these comments “reflect on the head of the military prosecution in the West Bank, who should at least pay lip service to providing a fair hearing for Palestinians.” Hirsch’s deeply disturbing indictment of a troubled 12-year-old Palestinian girl, arrested near a settlement carrying a concealed knife is another telling indication of his take on protecting Palestinian children, with the entire military legal system’s backing and participation. The girl was sentenced to four-and-a-half months in prison, of which she served two-and-a-half months, eventually released following an international outcry. The steady entrenchment of Israel’s occupation and dispossession of Palestinians, while eliciting some condemnation, has not yet led to meaningful international action. Still, the abuse of Palestinian minors in the military court system is one of the few matters that some countries have been willing to take up seriously with Israel. This is the context of the forthcoming event in Geneva: yet another example of NGO Monitor’s role in promoting Israeli government’s propaganda while smearing critical human rights groups. Now they have moved to trying to justify systematic abusive treatment of minors. But no PR exercise can eliminate the contradiction in terms known to the world as Israel’s “military justice system.” Only ending the occupation will. Sarit Michaeli is B’Tselem’s international advocacy officer.